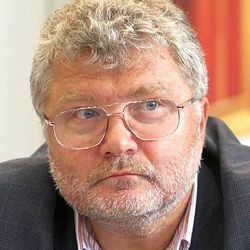 Quick Study: Yuri Polyakov leads a double life in Russian letters: he serves as editor of Literary Newspaper but is probably better known among Russian readers for best-selling novels that, according to a recent cover, appeal to women because they reveal so much about men. The Polyaknov File: Polyakov began publishing fiction in 1985, and one of his early novels, 100 Days Before the Command, which looks at military hazing, was adapted for screen in 1994. A cycle of Polyakov’s novels written in the early 2000s addresses family issues at the turn of the century, and his collections of essayistic pieces include Pornocracy, published in 2000. Polyakov also writes commentary about literature in contemporary Russian society and is a playwright. Polyakov’s prizes include a Gogol Literary Award in 2005 for his novel Carnal Joys. Psssst………: Polyakov is a member of the Presidential Council for Culture and Art. Polyakov’s Places: Moscow, including the offices of Literary Newspaper. Polyakov Recommends: Vladimir Lichutin, Yury Kozlov, Alexander Prokhanov, Vera Galaktionova, Viktor Pelevin (Homo Zapiens, Buddha’s Little Finger, and The Sacred Book of the Werewolf), and Alexander Terekhov (The Stone Bridge). Gogol Literary Award (“Oldworld Landowners” category) for Carnal Joys, as well as federal government and Moscow city awards, and the Big Bunin prize for autobiographical prose.